If you love DIY projects and have a passion for food preservation, why not learn how to preserve stone fruit? Making jams, relishes, chutneys and other tasty treats is completely within your reach thanks to this nifty infographic from Behance. You'll find plenty of tips for how to go about turning fresh summer fruit like peaches and plums into glorious canned concoctions. The first step, of course, is making sure you have all the necessary canning equipment. That may include jars, lids and rings as well as a water bath canner and a funnel, among other things. Unlike vegetables, which get pickled in vinegar, preserving fruit calls for boiling the fruit in a sugar syrup. The infographic offers instructions on how to make the perfect syrup, as well as guidelines for cooking and cooling your jars of preserved fruit. 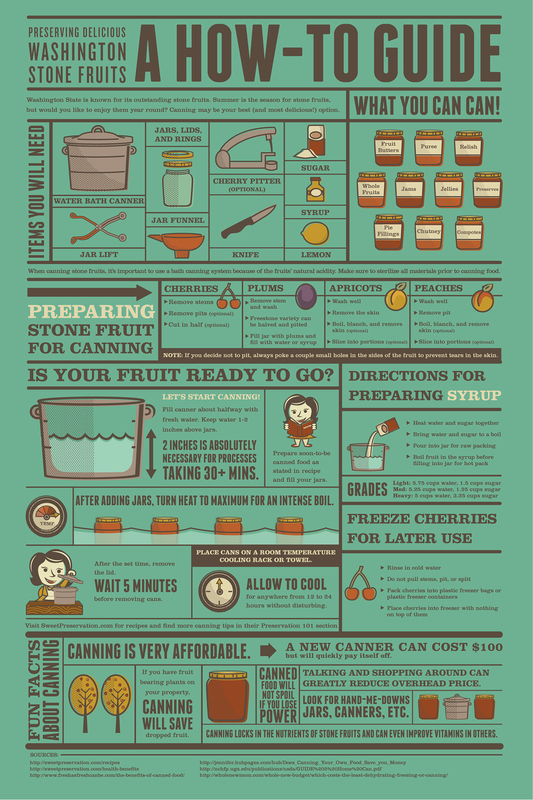 Take a look (click to enlarge) below and consult our FDL Guide To Fruit Preservation for your canning conundrums. Here are five great canning recipes to get you started.